The different methods depending on if you use comb, coil, wire or unibind, can be a manual or electric punch for heavier projects. 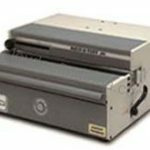 Below is a brief explanation of binding machines’ price points and how they’re used in a business setting. Unibind Systems – Very easy to use. 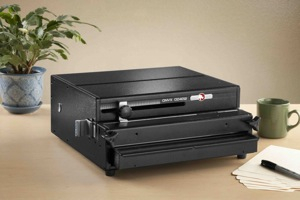 What makes the Unibind System so easy is it does not require any paper punching. You simply print out your presentation or document, place it into your binding cover, set on the heating element to bind. The heating element activates the binding glue which holds the document together. The covers come in multiple sizes and styles. 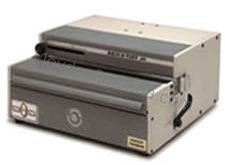 There are plastic cover for smaller documents and hard cover for a very professional document. If you need to swap out a page, you simply reheat the bind and remove and replace the page or pages. 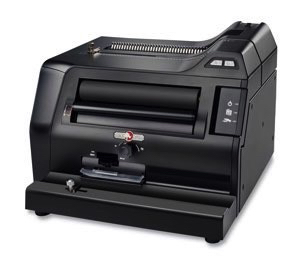 Unibind prices out between $455 for small office to $4500 for a large production model. If you have any questions deciding which works best for you, feel free to call the experts at Lloyds of Indiana. 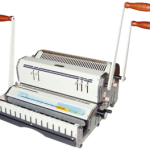 They can help you figure out the best solution based on how you will be using binding equipment. There is always a human to answer the phone.